First off - bravo for committing to staying healthy and taking control of your body! Exercising and eating right are the keys to losing weight naturally. 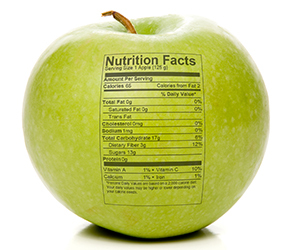 As part of your healthy diet you may be counting calories and aiming for the FDA’s recommended 2,000 calories/day. But don’t be fooled by that magic number; not all calories are created equal. Although calories play a huge factor in your weight loss and in keeping the pounds off, you need to make sure you’re eating the right kinds of calories. Think of calories as energy for your body. You want to fuel your body with high quality energy, not empty fumes that provide no nutritional benefit. There are many types of foods and beverages that are termed “empty calories”, meaning they contain calories but provide little more than sugar and carbohydrates as fuel. 1 Glazed Doughnut = 195 calories, 11 g of fat, 0 g of fiber, 86 mg of potassium, and 11 g of sugar. You may be thinking that an under 200 calorie snack is no big deal. 1 Medium Banana and 1 Tablespoon of Nutella for a chocolaty treat = 205 calories, 7 g of fat, 3 g of fiber, 24 g of sugar, 20 mg of calcium, 422 mg of potassium, plus a healthy dose of Vitamin B-6 and Vitamin C.
Although the banana option is slightly more in calories, you’re also getting fiber, vitamins and minerals that are sadly lacking in your “under 200 calorie" doughnut. Your body needs sustenance to avoid drops in energy (which often triggers you to overdose on caffeine or sugar for that pick-me-up high!) If you’re filling your daily 2,000 calorie/day quota with “empty calories” you’re doing more harm than good by depriving your body of needed vitamins, minerals, fiber, and protein.